View the UPDATED version of this article in its new location at Rotation.org. Training should not just be an event. Events are great, and we even have a great teacher training event described here. But what about the rest of the year? For better or worse, most training is "on the job" --and that type of training can be great IF you have someone helping you, showing you what to do, holding you accountable for the results, and cheering you on. This "Paste in My Hair" Teacher Training Blog post describes a way to do just that --how to improve and expand teaching skills as they teach throughout the year --by raising up great ideas and great expectations. We call it "Training by Lampstanding." 1. In Lampstanding, the leader raises the teacher's awareness of key creative opportunities coming up in the curriculum. They raise up the expectation that certain activities and techniques should happen, and then they raise up their level of support to help the teacher make it happen. 2. Lampstanding means the teacher's "enlightening" experience is raised up not just to shine on their students, but to shine as an example to other teachers. Lampstanding raises up examples of great teaching and shares the results with others. The problem that lampstanding addresses, other than the need for on-going training, is that a lot of "bushel smooshing" has been going on in Sunday School. In fact, "Bushel-Smooshing" is the opposite of Lampstanding. Leaders who hand out lesson plans to teachers and don't follow up on what the teacher may need help with or debrief how the lesson went. Teachers who take the "path of least resistence and simplest preparation" --avoiding creative ideas they are unfamiliar with or require extra effort. Video, music, and drama resources going unused. Worksheet and arts & craft activities being over-used. A teacher who "stays in their lane" subjecting students all year long to the teacher's learning preferences and blindspots. Teachers who think they don't have the time to be creative or try something new. Bushel-Smooshing eventually leads to teacher and student depletion and darkness. Whereas, lampstanding offers a friendly, supportive (and biblical!) approach to help teachers succeed at being more creative and successful in their lessons, and share their inspiring light with other teachers. Let's get into a few more "how to" details. Setting creative expectations higher, instead of hiding them politely under a bushel. Raising up awareness of the creative techniques in upcoming lessons to make sure the teacher sees them for what they are trying to accomplish, instead of how much work they will be. Providing resources to help teachers, lessons, and techniques shine. This includes being there to help prep and assist the day of the lesson you have identified. Following up afterward with teachers about what they learned and would change. Sharing the results with others. Lampstanding is also leading by example... identifying new things that will stretch your skill-set and theirs, and after doing them, sharing the light. Leaders: Lampstanding is not heavy-handed; it's caring leadership, and sharing leadership. It's sharing what you think is exciting in an upcoming lesson plan and offering your hands-on support. It's about expecting and equipping teachers to flourish, and raising up the results to inspire others. Teachers: "Lampstanding" is about building on your gifts, getting the support you need, and realizing your insights can be a blessing to others --all in an effort to evangelize our kids. 1) Raise expectations among the teachers. Let them know through training events, communications, one-on-one, and your presence alongside them in the classroom, that you want them to embrace creative approaches rather than avoid them, and that you will be there to support them. 2) Find a teacher who wants to be the first to be lamp-standed. Work with him or her to identify, plan, and lead upcoming creative opportunities in their lesson plans. Then LAMPSTAND the DAYLIGHTS out of that upcoming lesson and the results so that others can see and be drawn to its light. LAMPSTAND the teacher's insights and successes to others via conversations, email, handouts, and discussion at your next get-together. Be there with your cellphone camera to "catch them in the act of being awesome" and share that with your congregation. Well, it is if you do it, and there’s nothing like putting names and dates on a calendar to get something done. So why not gather a willing teacher by your side, pull out your calendars and lesson plans now, and make a plan to do some Lampstanding together. 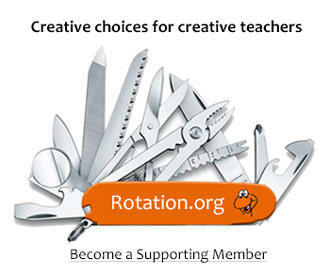 View the UPDATED version of this article in its new location here at Rotation.org. Some curriculum out there simply does not challenge your teachers, let alone your kids. It's "read and talk about this, and color or paste that." In a word: Yuck. But the better curriculums do have some variety, and a sharp leader or teacher will be able to spot the opportunities in them for lampstanding. If you're looking for some REALLY CREATIVE lesson plans to stretch your teacher with, then look no further than our own Writing Team Lesson Sets. Whether you're a traditional program or Rotation Model Sunday School, the Team's "extra creative" lesson sets offer you many different approaches to the same story: Art, Drama, Games, Videos, Music, "Science," Software, Cooking, and Movement. You can also read the Workshop Manuals and workshop forum resources we've written for various workshops. These are full of techniques. Read the Creative Bible Reading and Discussion thread. Read the lesson plans people are sharing to see how they are creatively teaching. The following is not a commercial, it’s the truth. During our 2015-2018 WT renovation of the Rotation Writing Team lesson sets, we purposefully emphasized including a VARIETY of ways to read the Bible, discuss questions, do interactive reflections, pray, etc. To cherry-pick this variety of techniques, you only have to look ACROSS the lessons in a set and across multiple sets. Or, simply teach with the lessons in the set, and over time teachers will learn a multitude of techniques. We also added "teaching tips" in a bunch of the lessons to explain to the teacher the "why" of doing something a certain way. Lampstanding was written by Rotation.org "Paste in My Hair" bloggers Neil MacQueen and Heidi Weber, with contributions from Amy Crane. Print both the Teacher Be-attitudes and Lampstanding articles as a PDF. but on the lampstand, and it gives light to all in the house." and give glory to your Father in heaven." We often think of Jesus as "the Light" but Jesus himself referred to his disciples as the light (or lamp) that shines. And in the local congregation, few lights shine brighter than that of our Sunday School teachers. But Jesus didn't just talk about “light.” In Matthew 5:15-16 Jesus talked about the oil lamp that holds and fuels the light, …a light that needs lit. He talked about the basket that can hide the light, and the lampstand that can lift that light higher. In this brief Bible study, we'll consider each important metaphor. What experience or persons "lit your teaching lamp"? Name a specific teaching gift (lamp) that you would like help lighting. Lamps require oil to stay lit. What things do you do or could you do to fuel your passion and preparation for teaching? coming up with creative ideas. sharing your gifts with other teachers. How do you keep those baskets from hiding the light that Jesus wants you to lampstand? Describe a time when YOU have been a lampstand to others (other than in your classroom), and when someone shared (lampstand-ed) their teaching light with you. Name one lamp (teaching skill) of yours that you think is especially "bright" and describe how you could share it (lampstand) to others. Written by Neil MacQueen and Heidi Weber for Rotation.org. Permission to use and adapt as you wish.